Island Heights, only accessible through Kennedy Township, located on a slope overlooking Neville Island. 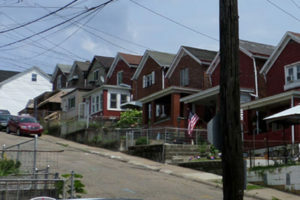 Pittock, very small Italian neighborhood located just off PA 51 Northbound, before the Fleming Park Bridge. West Park, a mixed residential and commercial neighborhood, where the majority of the buildings were built in the 1920s. Pleasant Ridge, a mixed-income housing development. Presston, a very small neighborhood of duplex townhomes, originally built as housing for the adjacent Pressed Steel Car Company. Norwood, a small, older neighborhood of small, mostly 2 story homes. This section of Stowe Township is inhabited by many families that are 2nd and 3rd generation Italian.